The Bach Society has sought to balance the history of the music they play with current themes of justice and discrimination in their performances. Columbia University Bach Society is not your average extracurricular commitment. Whereas many music groups try to modernize their content, the Bach Society diligently practices challenging compositions of high baroque and Western classical music. During their first performance of the year on Saturday, Nov. 10, Bach Society introduced the seventh director in their 20-year history: Andre Chan, CC ’21. With a background in Western classical music and composition from Phillip Exeter Academy and the Boston Philharmonic Youth Orchestra, Andre focused Bach Society’s first concert on the ensemble’s contribution to history and music. “What strikes me as very important to not only Bach Society but the core of the artistic philosophies of Bach himself, is that you cannot only study your contemporaries, but must also look back on history and find different peoples of history that contribute to those counter narratives that are being neglected in music history,” Chan said. Their first performance of the semester included works from Zelenka, Mendelssohn, Gal, and Mozart and exemplified the expertise expected by the club’s members and audience. In the past, the club has toured Germany, performed Handel’s Opera “Acis and Galatea,” performed at the 92nd St. Y and the University Club in Manhattan, and released their debut CD. According to Chan, their work has been consistently recognized to be remarkably high-level among Columbia’s music clubs. But the Bach Society is about more than just technical precision and exceptional music. The club’s president, Srinidhi Bharadwaj, SEAS ’19, explains that the club’s sense of community is essential to their members. “Since our last director, we have really emphasized this community culture—coming to rehearsal and singing with your friends—not just singing with people you barely know. I would say that this is something very unique to the Bach Society. You really love the people who come into the group,” Srinidhi said. 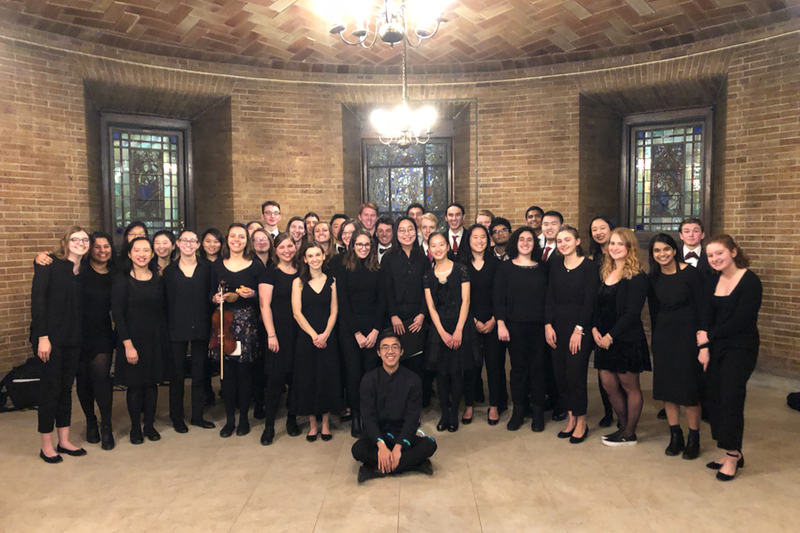 This semester, Bach Society has chosen to use their status as an important contributor to Columbia’s music scene to raise awareness about issues of discrimination. The selection to perform Hans Gal in their first performance held particular significance in the program. In the wake of the anti-Semitic attack on a synagogue in Pittsburgh, Gal’s Serenade for String Orchestra, written during the annexation of Austria, was a sober reminder that anti-Semitism has a persistent history. Though classical music may be a niche platform, the Bach Society’s decision to speak out is supported by more than just the desire to engage in activism. “At Columbia, we really pride ourselves on being people who are socially aware and socially responsible. We feel for other people’s pain—we really feel that. We don’t do it because activists and musicians are the same—we do it because we are just people,” Srinidhi said. Going forward, Chan plans to use the Bach Society’s position as an influential Western classical music group on campus to focus on areas that have been largely ignored by history. “As the music director of the Bach Society, when I’m making programs, I have my duties and obligations. However, the more important thing which concerns art is to express what is truly human, and I think if there is any program, it should do just that,” Chan said.